Have you seen the new Lego Ninago 2012 theme? It's the year of the snake. There are new snake enemies and who is the green Ninja? 2012 is the Year of the Snake for Lego Ninjago. Lego Ninjago has a new set of enemies: the snake people! Lord Garmadon's son Lloyd Garmadon is around too. The Ninja heroes are going to need all the help they can get. But who is the mysterious green ninja? Is is someone we already know, or someone completely new? 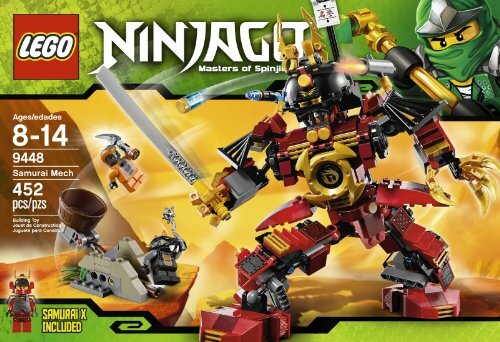 On this page we look at the Ninjago snakes story and some of the new Ninjago snakes sets for 2012. 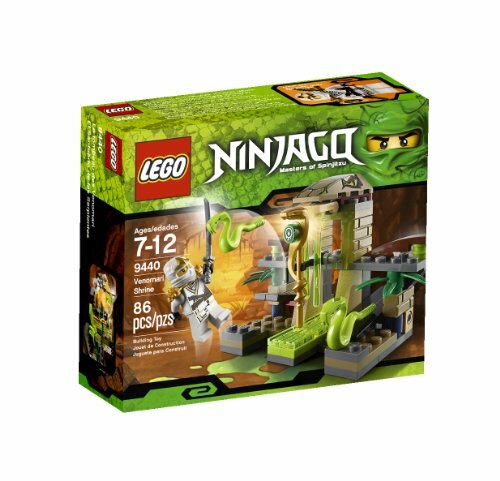 The new Lego Ninjago Snake People range came out in 2012 with new sets being released throughout the year. We love those gorgeous lime green boxes with snake skin print. There a five different tribes of snake people, each with different characteristics. The snake minifigures are amazing! They'll be appearing in new sets throughout 2012. 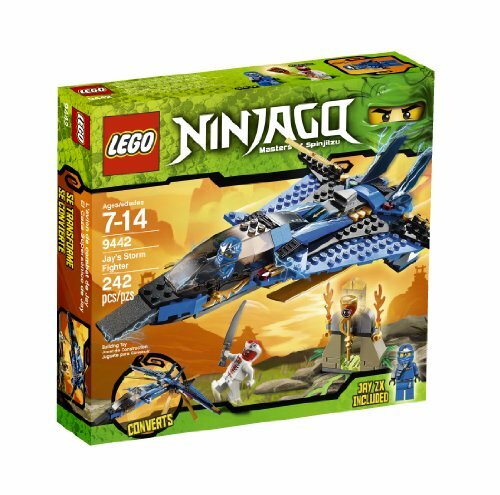 We've now got the Summer 2012 wave of Ninjago which include four new sets that tie in with recent happenings in the Ninjago TV series. Samurai X gets her amazing Samurai Mech robot. The ninjas get their Ultra Soonic Raider vehicle. There's a new snake vehicle for Lasha. 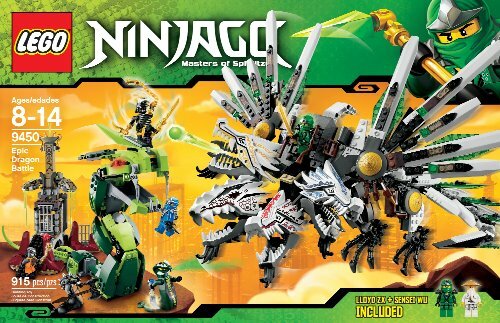 And then there's the new big Epic Battle set where we get The Great Devourer and the 4-Headed Dragon and also the Green Ninja, all in one big set. The snakes theme is brilliant! Let's take a look. The Lego Ninjago range has been a huge hit in our house. My boys love the whole Ninja theme and the backstory that comes with it including the Skeleton Army bad guys. Now we're enjoying the new Lego Ninjago sets for 2012. The new theme is Rise of the Snake and the new enemy is the Snake People! Let's take a look at the latest sets. Samurai X is a new helper for the heroes in Ninjago: Rise of the Snakes. Initially the identity of Samurai X is not known, but it has been revealed in the TV show. In this set you get the amazing Samurai Mech to build plus the Samural X minifigure and weapons. And of course Samurai X needs an enemy. Actually she gets two: Snike and Bytar of the Constrictai snake tribe - they're are the orange and black guys. They come with a snake catapult. This is a great set for fans of the show. The Epic Dragon Battle is the next BIG Ninjago set and features the big battle that The Rise of the Snakes TV series has lead up to. The Serpentine have been collecting the four fang blades to release The Great Devourer - a big snake which is included in this set. You also get the four-headed dragon which can fire a spit ball missile. The dragon is big and detailed and has a handle on top so you can move it around easily during play. This set also includes the green ninja, yes at last! You also get Jay ZX to help him out and Sensei Wu in a new outfit. There's Lord Garmadon. And from the Serpentine we get two generals: Acidicus and Skalidor (Constrictai general.) Chokun from the Constrictai tribe is also included. And there's also a snake prison with lots of cool bricks too. Wow! Then we have the ninja vehicle The Ultra Sonic Vehicle. It;s a flying vehicle and has extendable ninja blade weapons. This is a good set for Rise of the Snakes minifigures. You get Kai, Cole, Jay and Zane in their ZX forms. You also get Pythor the main villain of The Rise of the Snakes - he's the big purple guy from the Anacondrai tribe. Spitta is also included. This is the only set that currently includes Pythor P Chumsworth. 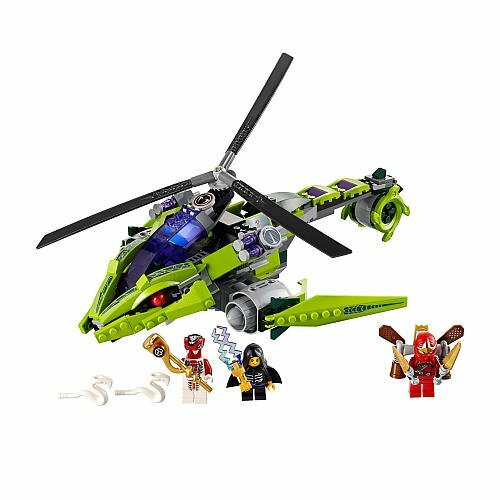 And we also get a new snake vehicle, it's Lasha's bite cycle and comes with a Lasha minifigure and also Cole ZX. This set also includes a Blacksmith Forge. Personally I love the Ninjago buildings, though my kids tend to be drawn to the cool green vehicles which I can understand. 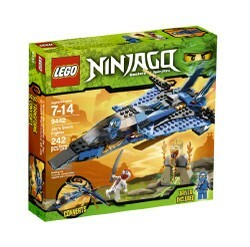 There are also new Ninjago spinners and booster packs for Summer 2012. Some of these sets features the new NRG outfits that the ninjas get. These are very cool - the heads are colored and the printing has cool designs featuring their element. The Rattlecopter belongs to Fang-Suei of the Fangpyre snake tribe - the new Ninjago enemies are snake people. I love the vibrant green and reptile features. The Rattlecopter is the centerpiece of this set and is packed with cool details. You also get Lloyd Garamdon in this set, he's Lord Garmodon's son and central to the Ninjago 2012 story. You get Kai (the red Ninja and main Ninjago hero) in this set in his new ZX clothing. He has a very cool Jetpack to fight Fang-Suei and retrieve the golden Constrictai staff - one of the new golden weapons. You also get two very cool snakes and weapons. This set includes Jay ZX. The ZX design mini figures are new for the 2012 Year of the Snake range. You also get Snappa, one of the Snake People. The Snake People are the new enemy in the Lego Ninjago universe. And there's a cool snake sword too. Jay is on a mission to retrive the golden Fangpyre staff with its powerful anti-venom properties. You get Jay's Storm Fighter plane to build. This set is recommended for age 7-12. The Venomari Shrine is one of the smaller sets in the new range. 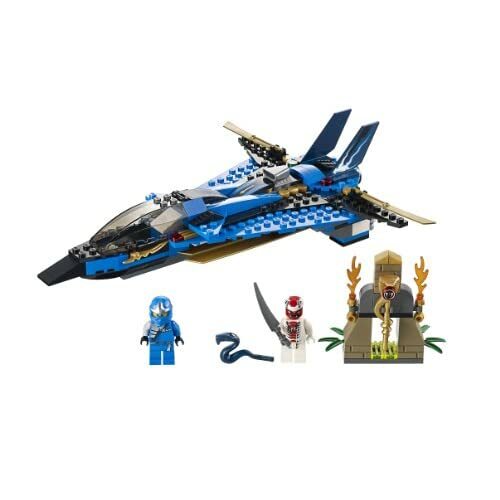 The Ninjago shrine sets are great value for money because they include an mini figure and lots of cool extra pieces. The Venomari Shrine set includes Zane ZX - in his new clothing after training to battle the snake tribes. The Shrine is full of snakey detail and hide the golden Venomari staff. Zane will have to surive the dual snake lauch attack and the toxic snake slime to retrive the staff. 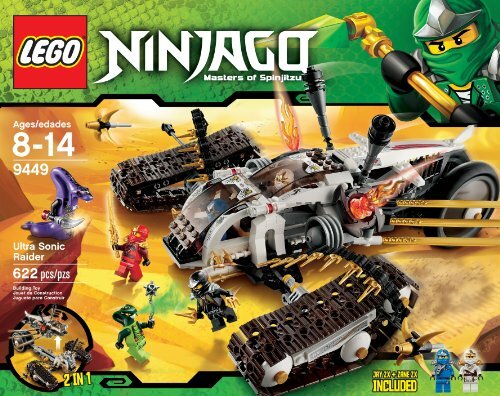 Ninjago Destiny's Bounty - Lego 9446 is the big dragon ship in the Ninjago 2012 snakes theme. And it comes with two of the very cool snake minifigures. The Snake People have snake-themed weapons and snake heads. We'll get to meet General Skales, Snappa, Rattla, Fang-Suei, and more. Wonderfully snakey names! The Ninjas will have to defend themselves against snake venom and retrieve the golden snake weapons including the golden Constrictai staff and the golden Hypnobrai staff. There are 5 snake tribes of Ninjago: Venomari, Hypnonbrai, Fangpyre, Constrictai and Anacondrai. Collectively they are known as the Serpentine. 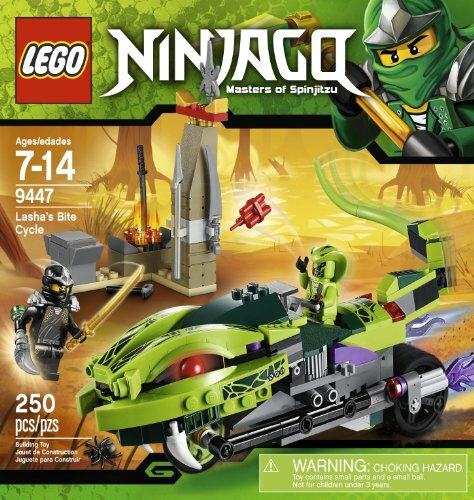 The Lego 2012 Ninjago story features a mysterious green Ninja? Who is he? Well we know. Do you? Samurai X helps out the Ninjas in the fight against the snakes. Samurai X has a huge robot that he or she controls. Who is Samurai X? Well we won't give it away here, but if you want more clues take a look at Ninjago Samurai X. In order to fight the snake people, Kay, Jay, Zane and Cole have been training hard. To reflect this there are new ZX design minifigures with their new costumes. The new range also features Kendo armor for the Ninjas. Kendo is a modern japanese martial art. A collection of Lego Ninjago posters. Great for kids bedrooms and as Ninjago Party decorations. What do you think the the Ninjago Snakes theme? The Lego Ninjago game looks like an enchanting game for kids, especially for boys! Lego ninjas? This is awesome!